You probably know his works of sculpture better than you recognize his name. Today is his birthday. During his lifetime he was considered America’s preeminent monumental sculptor, creating large scale memorials, portrait busts and relief sculpture that can be found throughout the United States. Have you ever seen (or viewed a photograph of) the colossal seated Lincoln sculpture at the Lincoln Memorial in Washington DC? Or perhaps you’ve admired the Minute Man statue by the North Bridge in Concord MA. He created both, and so many more. If his Minute Man statue seems familiar, it was also used as the model for World War II defense bonds, stamps and posters. Daniel Chester French was born 20 April, 1850 in Exeter, New Hampshire to a prominent New England family, with many connections. Although most of Daniel Chester French’s sculptures are located outside of his native state, there are a few fine specimens here in New Hampshire on public view. On the wall beside the sculpture are the names of 48 St. Paul School students who died during World War I. The sculpture and memorial was dedicated in the Spring of 1929. You will have to walk around to the back of the building to see this bronze and granite tribute to one of New Hampshire’s famous naval officers, born in Hopkinton NH. He served during the Civil War. Although he never rose above the rank of Captain, following the war a Congressional action presented him with the rank of Commodore. Daniel Chester French’s paternal grandfather, Daniel French, was Attorney-General of New Hampshire, and his maternal grandfather, William Merchant Richardson, Chief Justice of the same State. His grandmother, Sarah Flagg French, was a connection of Daniel Webster, while his great-grandmother, Dorothy Whittier, was related to the poet John Greenleaf Whittier.He was a neighbor and friend of Ralph Waldo Emerson and the Alcott family. As a boy he lived in Cambridge (1860) and Amherst (1865), MA then moving with his family to Concord MA in 1867. He was briefly educated at the Massachusetts Institute of Technology, followed by sculpture lessons by Abigail May Alcott, and an apprenticeship with John Quincy Adams Ward in 1870. He also took evening drawing classes at the National Academy of Design. He was only twenty-three years old when he received his first important order, that for the “Minute Man,” portraying “in animated attitude, a youthful New England farmer turning from the plow to the battlefield.” (Schools and masters of sculpture, by Alida Graveraet Radcliffe, 1894, page 493). 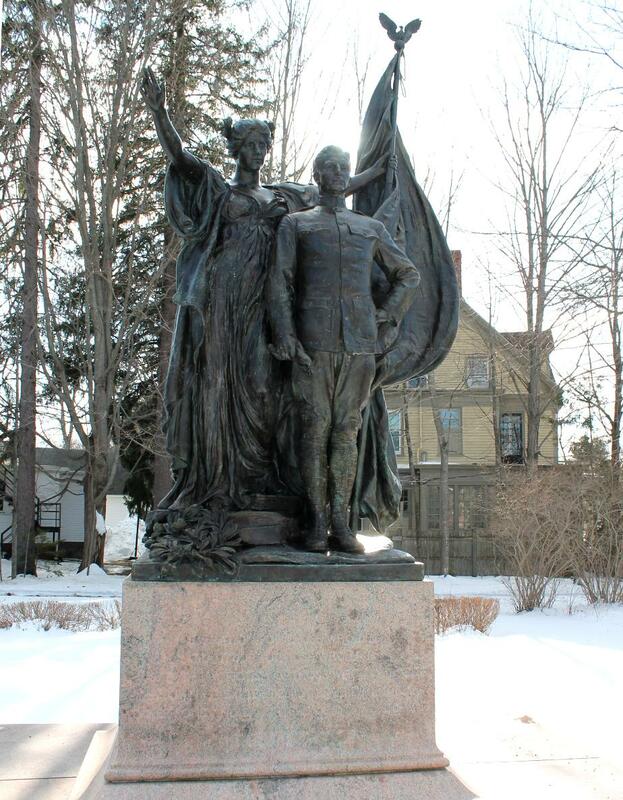 This bronze statue was completed at the Ames Works in Chicopee MA, and was unveiled on 19 April 1875 at Concord MA, and it occupies the spot near the Old North Bridge on the Concord battle-field where the militia stood in 1775. Important speakers at the unveiling included Ralph Waldo Emerson, James Russell Lowell, and George William Curtis. Previously in 1836 that spot had been marked by a plain monument. He was a remarkable and extremely talented man. Even today his sculpture brings frequent words of praise by those who view them. Life From the Roots: Where Was the Lincoln Memorial Made? Edward French was born about 1590 in England, and died 28 December 1674 in Salisbury MA. With his wife Ann and two or more sons (including Joseph) he came to America in 1636-7, and became one of the founders of Ipswich MA. He later was one of the original settlers of Salisbury MA where he was a prominent member of the community, paying the third largest tax and serving as one of the “Prudential Men” in 1646 and again in 1648. He died 28 December 1674 and his will, filed 13 April 1675 can be found in the Court House in Salem MA. He was a tailor by trade. His wife was possibly a sister of Richard Goodale. She died 9 march 1683 in Salisbury MA. SEE HERE for theories of Edward French’s origin. Joseph French, eldest child of Edward & Ann (Goodale) French, was born in England and reared in his father’s trade. He and his wife Susannah were members of the Salisbury MA Church in 1687. He was taxed in Salisbury as early as 1652, and received land there in 1654. His wife died 16 February 1688 and he survived her over twenty two years, dieing 6 June 1710. Joseph French, eldest son of Joseph-1 and Susanna French was born 16 March 1654, and died 14 December 1683 in Salisbury MA, where he was a farmer. He subscribed to the oath of allegiance and fidelity in December 1677. He married 13 June 1678 to Sarah Eastman, eighth child and daughter of Roger Eastman, who surived him and remarried 4 Aug 1684 to Solomon Shepherd. Joseph French, eldest son of Joseph and Sarah (Eastman) French, was born 26 March 1679 in Salisbury MA, and died 27 December 1756. He was known as “junior” while he served in that town. He appears in Salisbury records as a carpenter in 1728 and 1739 and as husbandman in South Hampton in 1747. He probably did not move his residence, but rather the province line set in 1741 moved some residents to New Hampshire, the town of South Hampton being established in 1742. He married 20 December 1699 to Abigail Brown, daughter of Philip and Mary (Buswell) Brown, and granddaughter of Deacon Henry Brown of Salisbury MA. Daniel French, son of Joseph-3 and Abigail (Brown) French, born 21 Aug 1708 in Salisbury MA, died 1 Sep 1783 aged seventy-five. He married 28 May 1730 to Sarah Gould, dau of Samuel & Sarah (Rowell) Gould. She was born 1710 and d. 25 January 1773 aged sixty-three. Gould French, third son and fifth child of Daniel & Sarah (Gould) French, was b. 17 Sept 1741 in Salisbury MA and died 12 May 1823 in St. Albans, Maine, aged 83 yrs old. He was buried in Palmyra with his son Dr. Benjamin French’s family. He resided in Epping NH where he was a farmer and resided on a place given to him by his own father. He served as a private in the American Revolution in Captain Joseph Chandler’s company, of Colonel Isaac Wyman’s regiment. He moved to Maine about 1802. He married Dorothy [Dolly] Whittier, of Amesbury MA, dau of Joseph and Martha (Evins) Whittier. She was born 30 November 1745 and died 13 Dec 1804. 4. Dorothy “Dolly” French [twin], b. 22 Feb 1769 in Epping NH; she married September 1789 to John Eliot, son of Edmund & Mehitable (Worthen) Eliot. After their marriage they removed to Northwood NH where their children were born and then to Corinna, Penobscot Co, Maine.They had several children. Hon. Daniel French, son of Gould and Dorothy (Whitmarsh) French was b. 22 Feb 1769 in Epping NH and d. 14 Oct 1840 in Chester NH. He studied at Phillips Exeter Academy and then studied law in the office of Hon. William K. Atkinson at Dover NH. He was admitted to the bar in 1796. He practiced at Deerfield Parade two years. Then Daniel French moved to Chester NH in 1800 to take the office and business of Hon. Arthur Livermore who had been appointed Judge of the Superior Court. Mr. French was Attorney-General of the State of NH from 1812 until 1815, when he resigned and continued practice as a lawyer until his death in 1840. He was postmaster of the town from 1807 until 1839, when he resigned and his son succeeded him. He married three times: 1st) 15 September 1799 to Mercy Brown, daughter of Benjamin and Prudence (Kelly) Brown of Newbury. She died 8 March 1802 in Chester NH. He married 2nd) 30 June 1805 to Betsey Van Mater Flagg, dau of Josiah & Anna (Webster) Flagg. [Josiah Flagg Esq. was an officer of the Revolution, and son of Rev. Ebenezer Flagg.] She was born in Chester NH 12 Feb 1778 and d. there 23 April 1812. He married 3d) Sarah Wingate (Flagg) Bell, sister of his second wife and widow of Jonathan Bell. She was born in Chester NH 31 May 1782 and died 18 Dec 1878. The Daniel French House, built in 1800 in Chester NH was destroyed by fire in 1902. 2. Arthur Livermore French, b. 28 May 1806; died unmarried 25 Apr 1825, an undergraduate at Dartmouth College. 9. Edmund Flagg French, b. 17 July 1819; lived Washington DC; he m. Margaret Brady. Their daughter Mary Adams French married her cousin, Daniel Chester French. 11. Helen Augusta French, b. 1 Feb 1824; m. as his 2nd wife, Gerry Whiting Cochrane. She was a noted author, and died at Chester NH 20 Jan 1902 shortly after her beautiful home was destroyed by fire. Henry Flagg French, son of Hon. Daniel & Sarah Wingate (Flagg) French, born 14 Aug 1813 in Chester NH. After the death of his father he removed to Portsmouth, and then to Exeter NH. A lawyer, and Assistant US Treasury Secretary, and author of a book about farm drainage. He married 9 October 1838 to Anne Richardson, daughter of William M. & Betsey (Smith) Richardson. On 20 August 1856, When their son Daniel was 6 yrs old, Anne Richardson French died, leaving four children, two daughters and two sons. He remarried to Pamela M. Prentice of Keene NH, daughter of John Prentiss. Henry was educated at Derry and Pembroke NH and Hingham MA. He studied law with his father and at law school in Cambridge MA. He was admitted to the bar in 1835 and practiced law, being solicitor of Rockingham County NH from 1838 to 1848, and bank commissioner from 1848 to 1852. He was a justice of the Court of Common Pleas in NH from 1855 to 1859. He then moved to Cambridge MA in 1860 opening a law office. He purchased a farm in Concord MA. He made an agricultural tour of Europe in 1857. Dartmouth College conferred on him the honorary degree of A.M. in 1852. In 1876 Hon. Lot M. Morrill of Maine, then Secretary of the Treasury, appointed Henry French Assistant Secretary of the Treasury of the United States. He held this position until his death 29 November 1885. 1. Harriette Van Meter French, b. 29 Sep 1889; m. Major Abijah Hollis, of Concord NH and Milton MA on 9 July 1864. Children [HOLLIS]: Thomas, Anne Richardson, Henry French, Allen, Harriette Van Meter. 2. William Merchant Richardson French, b. 1 Oct 1843 Exeter NH; director of the Art Institute, Chicago for 35 years. He died 3 June 1914. He attended Phillips Exeter Acadmy and graduated from Harvard College in 1864. He served in the Civil War in a Massachusetts regiment. He married on 27 March 1890 in Chicago IL to Alice Helm, and had two sons, Henry H. and Prentiss French. According to his obituary, his sons, with his brother, Daniel C. French, the sculptor, were at his beside when he died. He is buried in Mount Greenwood Cemetery in Chicago IL. 3. Sarah Flagg French, b. 14 Aug 1846; m. Edward J. Bartlet on 19 June 1873. One child [Bartlett]: Mary Chivering Bartlet, b. 26 Feb 1875 in Concord, Massachusetts. Mary C. Bartlet married 27 September 1905 at Concord, MA to Philip A. Davis, son of Nathan A. & Mary (Orne) Davis. 4. +Daniel Chester French, b. 20 April 1850 Exeter NH. [Sculptor–See biography and links above] He died 7 October 1931. Daniel Chester French, son of Henry Flagg & Anne (Richardson) French, was born 20 April 1850 in Exeter New Hampshire, and died 7 October 1931 [see also above biography and links]. Famed sculptor. In 1888 he married his cousin, Mary Adams French, daughter of Lt. Edmund & Margaret A. (Brady) French (b. 28 Oct 1859 in Washington DC, d. 1939). They made their home in New York City, summering in Massachusetts and New Hampshire. In 1897 he purchased an estate in Stockbridge, MA to serve as his summer residence, calling it Chesterwood, where he died in 1931. Some of his letters and papers can be found at the Concord (MA) Free Public Library. CRESSON–Margaret French, age 84, suddenly, at her home Chesterwood, Stockbridge MA. Wife of the late William Penn Cresson, daughter of the late Mary Adams French and Daniel Chesier [sic Chester] Grench. Funeral service at 2 o’clock on Friday, October 5, at the Barn Gallery Museum, Chesterwood, Stockbridge, MA. If desired, donations may be made to Chesterwood or to the Berkshire Museum, Pittsfield MA. 1. Margaret French, b. 3 Aug 1889 in Concord MA, d. by 4 October 1973 in Stockbridge, Bershire Co. MA; m. 1921 to William Penn Cresson. He was born in 1864 at Claymount DE, and died at the age of 59 on 12 May 1932 at Stockbridge MA. He was an architect and author. He designed the Embassy of Ireland located on Massachusetts Ave/Sheridan Circle in Washington DC (it was originally a family home between 1908 and 1909, and was bought in 1949 by the Government of Ireland. She was a talented scupltor, working in bronze and marble, specializing in portrait heads, reliefs and memorial plaques. She studied under her father, with Abastenia St. Leger Eberle and George Demetrios, and at the New York School of Applied Design for Women. She also worked industriously to preserve the legacy of Daniel Chester French and the Chesterwood estate. Her Journey into Fame: The Life of Daniel Chester French was published in 1947. In 1969 she donated Chesterwood and its collections to the National Trust for Historic Preservation. In addition she was very active in supporting many projects and programs in Stockbridge MA. 1. Genealogical and Family History of New Hampshire, Volume 4, by Lewis Publishing Company, Chicago, page 1799-1800. This entry was posted in Genealogy, History, New Hampshire Men and tagged artist, Chapel George H Perkins, Concord, Daniel C French, Daniel Chester French, DC, Exeter, French, Gale Park, Hampshire, Lincoln, monument, new, New Hampshire, NH, sculptor, seated, soldier, Soldier and Sailor, St. Pauls School, State House, Washington. Bookmark the permalink. Looking for genealogy links in NH for my great-great grandfather Daniel F Blanchard born April of 1844, unknown parents. Probably born Stoddard in Cheshire county but is also a possibility born in Mass. There has been family speculation his last name may have been Parker at some time but I have not located any info to that query. Also looking for Robert Wilkinson born around 1760-70 in the same area. If you know of any info it would be greatly appreciated. William French was 22 years when killed by British Army on the Court House steps. Does anyone know Daniel Chester French’s deaf son’s name? He did not have a son. I’m a descendant of John French (so a distant cousin to Daniel Chester) and was looking through our geneology last night. Our records indicate that Edward’s wife Ann was Ann Swayne, dau. of Bennet. They also say that Edward came to America in on the “Angel Gabriel”, which wrecked off the coast of Pemaquid, ME from a hurricane on Aug 16, 1835, and from there he went to Mass. Laura, there are several theories out there, and here is a link to them. My best to you with your French family research and thanks for posting! Thank you for the link! I have a lot of resources already, as one of my great uncles, Henry Dana French, did a lot of research on the family in the 1930s or so and we have copies of his papers, but I didn’t know about this site! Janice-Thanks so much for the well-researched genealogy of DCF. Family lore says there is a distant relation but I’m not sure if this is accurate. At any rate, thanks for sharing your research.